Do We Blame Apple, Or Ourselves? My experience listening to this podcast was in a way, very similar to that of Mike Daisey as he explored the Foxconn factory: I was very much aware of Apple’s Foxconn scandal, yet Daisey’s journey to Foxconn opened my eyes to the harsh realities and atrocities behind the press coverage. Hearing statistics such as number of employees, alongside the average shift duration, (12-14+ hours), was appalling. What was interesting for me was that as I listened to the podcast on my Macbook Pro, with my iPhone sitting beside; I started to mentally deconstruct each device and imagine them being made in the Foxconn plant. Listening to Mike Daisey describe the labor-intense process that goes into each device made me think much deeper about the pieces of technology I posses: Daisey describes how Foxconn not only has contracts with Apple, but also with major tech-giants like Microsoft, Sony, and Hewlett-Packard to name a few. Taking a different approach to this podcast, I thought mostly about how we as consumers, and citizens of a global community fit into the Foxconn-Apple narrative. Upon hearing the podcast, I researched the media coverage of the ‘Foxconn Scandal’, when the atrocities at the Foxconn factories were originally brought to light. During the periods of high media coverage in 2010 and 2012, Apple’s stock price only grew. Daisey alludes to the idea of Apple as a religion in the beginning of his excerpt, and it is a fact which I believe is key in the perpetuation of this narrative at Foxconn. Arguably Daisey’s most powerful quote is when he states “Do you really think Apple doesn’t know?” This speaks to the notion that Apple, a company that is resolute in its standards for quality and control over the design of their products, would not be fully aware of the production processes taking place. While Dailey’s words are powerful, they are not necessarily surprising. Apple, and the other tech-companies employing Foxconn, undoubtedly know the atrocities which occur in Foxconn factories. What we as consumers have shown Apple in particular, is that so long as Apple turns a blind eye, we as consumers shall do the same. In talking about the Apple religion, Daisey states that one of the most dangerous things to any religion is ‘when people think’. Looking at your Macbook Pro, or iPhone and thinking deeply about how the product was made. As consumers in this age of transparency, we are granted the ability to make decisions with access to information. There is a disparity between the reactions to hearing stories at Foxconn, and our reactions to hearing the latest Apple product or ad. Thus the obsession with Apple products is arguably unhealthy, as it contributes in part to a culture in which a company can make brutally unethical decisions, and receive positive feedback from consumers and retain stringent brand loyalty. After listening to this podcast I can’t really say that I’m too surprised about what Mike Daisey had discovered about the working environments of technology companies. In past classes I’d read or watched videos about what it’s like to work in a sweatshop for a company like Nike, but this is my first time learning about a technology company. I was also unfamiliar with the company FoxConn that he investigated. The part of the podcast the stood out to me the most was easily the working conditions of the factories, and the mental and physical harm inflicted upon the workers that work at one of these factories. In my opinion, the most horrifying discovery was how the factories would have nets to catch people that attempted to commit suicide while at work, because they couldn’t stand to live any longer while working for FoxConn. The fact that the company decided to put up nets, instead of taking a step back and actually witnessing the harm being caused and trying to change it for the sake of the workers is mind boggling. The next part of the podcast that really stood out to me was when one of the workers was shown an iPad for the first time. I was very surprised that while working in the factory, this worker had never seen or interacted with an operational iPad before. When the worker described the iPad as “magic” I couldn’t help but feel like the worker, despite all the hardships he had to work with, still felt pride at what he helped create. The last part of the podcast that I found the most interesting was when the topic of whether or not the workers had mental problems, and that was the reason for their continued work at the factories. I sided with Daisey in believing that the workers are not mentally handicapped. This discussion made me wonder about how Americans would deal with their lives if they had to live and work like the FoxConn workers. Apple consumers can usually sum up their experience with their new gadgets with one word…obsession. The company has grown a network of users that are loyal to the brand, and form apple loving communities. Customers are usually tech-savy, smart, and even geeky. But at the same time, Mike Daisey’s podcast says differently. These people are completely ignorant of the terrible processes that gives them their shiny new toys. By transforming himself into a amateur touristy reporter, Mike Daisey recovered the awful truth. 430,000 Chinese factory workers at a electronic producing company called FoxConn are underpaid, brainwashed, exploited, harmed, and even killed by their employer. This is all done in the process of providing Americans with electronics labeled ‘Made in China’. Several things about the podcast struck me. For one, the severity of the working conditions was disgusting. I could not help but cringe when Daisey pointed out that many workers praised the chemical n-hexane which cleaned iPhone screens faster than alcohol, but also caused trembling hands. Daisy also pointed out the endless motions that workers repeated hour after hour causing their joints to disintegrate. Not only were workers left with disabled hands, but they were also paid minimum wage and often worked 14 hours a day. Daisey’s tone also highlighted the horrors of FoxConn’s use of child labor, and their willingness to brush misdemeanors under the rug when auditors came around. This raised the question, do you think Apple really doesn’t know?Something must be done. Apple claims to send oversight committees to analyze conditions and force compliance with protections. But how could something so awful still be going on? I agree with Daisey’s simpler solution; the rotation of workers. This would save their hands and maybe even prolong their lives. However, action will not be taken unless Apple takes a more sincere interest. They must recognize the problem first hand and listen to the voices of humanity rather than economists who claim that consumers should not feel weird about the turmoil behind their flashy screens. Enforcing protection is a feasible task and these tragedies are avoidable. As I write this, I cannot help but feel guilty as I look down at my shiny white key board. Just how many hands before my own grazed this surface? How many people suffered so that I could have the ability to type? I found this podcast to be eye opening and powerful in regards to the manufacturing of our electronic devices that are attached to our hips 24/7. 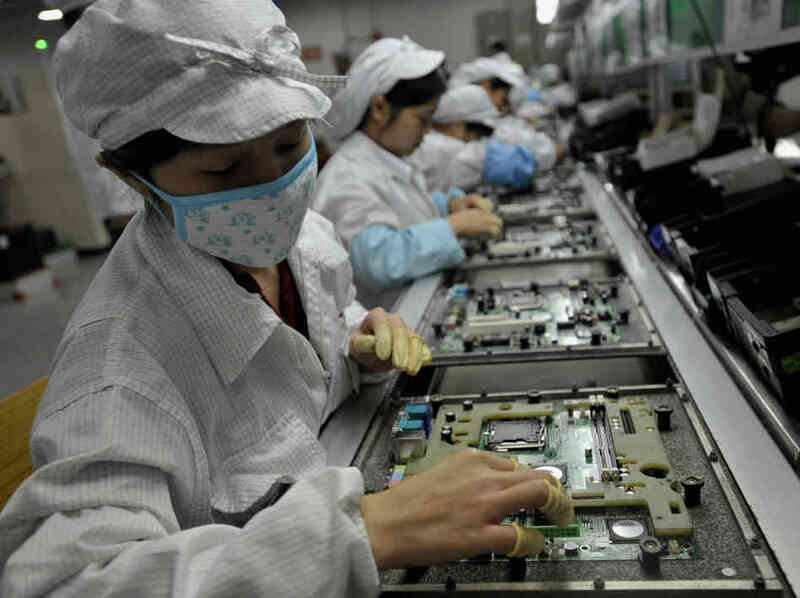 Building and assembling these devices that we have on us at all times is not just the job to many people, but also a physical and mental burden to the employees of Foxconn Factory. Many people do not even know where these devices are manufactured. I learned that the name of this town is Shenzhen. Daisey does an excellent job of setting the scene and explaining his first impressions when entering the town. He says that Shenzhen looked as if Blade Runner had thrown up on itself and with LED lights, neon colors and “ugly Chinese advertising”. I found this description to have an interesting connection to his reaction to being in the factory because he speaks about how he expected to hear the sounds of machinery, but instead he only heard the sounds of bodies in constant motion. The description of the town contrasts from the one of the factory because in a developed town you would think that there would be high tech machinery, but instead there is an abundant amount of overworked employees. It was evident that this investigation had a strong emotional impact on Daisey and he even says that he felt himself being “rewritten”. He asks the question of “how often do we wish things were hand made” embodying that human touch. The same “human touch” that these handmade products have are the hands of many employees that have permanent joint damage or even crippled hands from mishaps in the factory. The same hands of the people that slide into their coffin like beds with the lack of hope that tomorrow will be better and they soon will escape these awful conditions at Foxconn. The description of the living conditions of the employees had a strong affect on me because it was further proving how this is how these people live day to day-slaves to our technological world. Not only do the employees of Foxconn work in the over packed factories with no sound other than the motion of bodies, but also go to work everyday to see nets at the bottom of high buildings where many employees have committed suicide. In 2010 there were twelve suicides at the factory- twelve innocent lives that were lost due to the unethical and horrible working conditions. Every time I use my phone I will be more conscious of the amount of work that it took for people to assemble it. I will also be more aware of Apple’s lack of acknowledgement of the issues at Foxconn and how their obsession with details does not translate to their knowledge of these conditions when asked about them. A further Investigation of Apple, Inc. Right off the bat, This American Life host Ira Glass had me very intrigued in his podcast “Mr. Daisey and Apple”. Holding a new iPhone 4S, Glass simply asked Siri, “Where were you manufactured?” It seems to be a simple question, one that a software with the power of Siri should certainly be able to answer. Hell, I feel like Siri could find me the nearest McDonalds in Antarctica if she had to. Siri is unlike any technology I’ve ever seen before, which makes her response that much more intriguing. She says, “I am not allowed to say”. It is a blunt, simple response, yet one that carries an incredible amount of meaning behind it. Soon after his experience with Siri, Glass introduces Mike Daisey as the main feature of the podcast. Daisey spends the next hour investigating further into all the practices of Apple that the public has a tendency to overlook. I was very interested in Daisey’s anecdote about his approach and experiences regarding the Foxconn plant in Shenzhen, China. I had never even heard of Foxconn before, which I find unbelievable now that I know Foxconn has over 430,000 workers and manufactures technology products for Apple, Samsung, Panasonic, and more. Daisey’s description of Foxconn and the industrial Chinese city of Shenzhen blew me away. I read George Orwell’s 1984 my senior year of high school, and I personally consider it one of my favorite novels of all time. Therefore, you can see why the similarities between Foxconn and 1984 resonated with me loud and clear. Daisey speaks of armed guards at Foxconn, 13 year old workers, and nets installed on the side of buildings to stop the recent rash of suicides from employees. After the story about his investigation of Foxconn, Daisey drops the million dollar question. The question that the whole podcast and the discussion of Apple is centered around. “Do you really think Apple doesn’t know?” Or, “do they only see what they want to see?” Daisey talks about Foxconn and Shenzhen (I’m also blown away I had never heard of this city) and the labor situation there as though it is the United States during the 1800s’ Industrial Revolution. He refers to 15 hour days, workers dying from exhaustion, chemical exposure, and cramped living conditions. On top of that, camera’s are everywhere, which makes Shenzhen a perfect storm of 1984 and Industrial Revolution combined. A laborers’ worst nightmare. On a larger scale, through this podcast my eyes were definitely opened to the cruelty of the working conditions in China. I always knew Apple and other major technology companies employed some questionable tactics regarding the manufacturing of their products overseas. However, my awareness was raised immensely after hearing Mike Daisey’s stories from Foxconn. I was especially struck since I listened to the podcast and typed this blog post on my Apple MacBook Pro. It makes you wonder who produced and manufactured my laptop, and what kind of conditions they manufactured it in. It is clear that Apple knows about the problems taking place in China at factories where Apple products are produced. Apple claims to be transparent, and seems to be taking steps to improve the conditions overseas. However, I agree with Daisey in that I question how much effort Apple is really putting into solving these problems. They still are withholding lots of information from the public about the issues. Moving forward, I will definitely remember what I heard in this podcast, and I will keep my ears open for any public news regarding more changes Apple may finally be attempting to make.